The AudioCubes look great, but will only ﬁnd long-term use among a very specific crowd. Short sensor range and limited sensitivity is restricting. Audio capabilities are difficult to work out. Hip to be square: the AudioCubes certainly turn heads. Setting up is done in the MIDIBridge software. 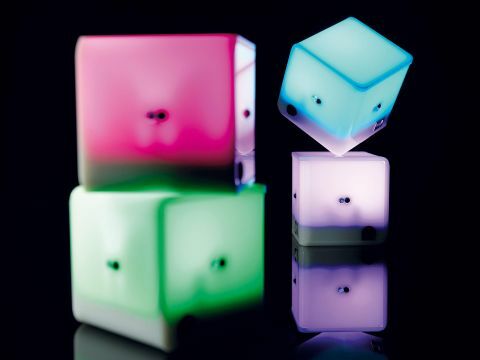 The AudioCubes were designed by Bert Schiettecatte, who wanted an object-based MIDI control surface for working with music software such as Reason and Ableton Live. Sold in sets of either two or four (though you can add as many as you like), the Cubes communicate with each other via infrared and with your music software via the supplied MIDIBridge (a Max/MSP-based application). They send information based on (a) the proximity of other objects - hands, cats, whatever - in 'sensor' mode, or (b) their position relative to a designated 'receiver' Cube. The Cubes have a maximum range of around 10cm/4 inches, which is pretty short. You can, however, control the cubes from distances up to 70 centimetres if you use a sender cube with a sensor cube, instead of using your hand with a sensor cube. We tested the AudioCubes on a MacBook Pro, running OS X 10.5.5, and Ableton Live 7. They need a three-hour charge before they can go wireless - you can charge them from a USB hub, or if you have a mains-powered hub, they'll charge from that without involving a computer. The charged Cubes run for about three hours, and each one's got an on/off switch on the bottom, which helps with battery life. MIDIBridge is used to set Cube modes, MIDI routing, notes, CC numbers and so on. Furthermore, each Cube can be assigned a colour - drag around in the MIDIBridge colour selector, and watch the Cube change in real-time. We began by using two Cubes to transmit notes to trigger Live's Session View clips. One Cube (the receiver) stays hard-wired to the computer, and the other (sender) is positioned facing it. Rotating the sender generates a MIDI note - so you'll get up to four notes this way. But move the sender to another side of the receiver and repeat the process and you'll get another four notes. We make that 16 notes from two Cubes. We enjoyed the semi-wireless operation, and the Cubes were already attracting attention in a way that keyboards don't. Next, we wanted to use sensor mode to send MIDI CCs. Sensor Cubes have to stay connected via USB - instant cable chaos - although we're told that this problem will be eradicated with an upcoming firmware update. Every side of each Cube has to be calibrated individually, which means a lot of finger-waving around the Cube, while using your other hand to move a slider and click the calibrate button repeatedly. Once done, the setting can be saved as a preset. "The Cubes attract attention in a way that keyboards don't." Cube modes can also be combined: Pair 'A' could be two sensor Cubes, cabled to the computer, sending CCs, and Pair 'B' could be one receiver, also cabled, and a 'free' wireless unit sending notes. In another test, we set up four sensor cubes on a hub, assigned them to some Live audio effect parameters, and got a couple of friends over for a 'jam'. Actually, it felt more like a museum exhibit than a jam - but we had enough control to enjoy ourselves. Later, we loaded a Live Theremin preset, and used a sensor Cube to control pitch and volume, but the sensor range was a problem. Over such a short distance, the jumps in value are too high. We also tried the Cubes with Arkaos VJ and Logic Pro - setup was a breeze with Arkaos, not so with Logic, as the Cubes' calibration and Logic's less-than-transparent MIDI mapping beat us to a bloody pulp. The Cubes do other things, too - they can generate their own tones, and process incoming audio, sending it on either wirelessly, or through the jack outputs on their sides, theoretically creating a wireless modular synth. However, in the short review period, I couldn't get anywhere with this, beyond generating a very low-res sine wave. These audio capabilities are definitely secondary to the MIDI control uses. Music as we usually understand it corresponds to keyboards, guitars, mixers and drums - not glowing bricks - so the AudioCubes can feel more like an art/research item than a mass-market music production tool. They're an addition to, rather than a replacement for what you're using - they might make a good combination with a mixer controller. If you're more inclined to spend your days creating Max/MSP or Reaktor patches than working on music, you might like them. We're sure that audiences will love them, but it's your call whether that makes the AudioCubes worth the money.